http://media.blubrry.com/w2l7/p/media.blubrry.com/noodlemx/p/welcometolevelseven.com/wp-content/podcast/WTL7_106.mp3Podcast: Play in new window | DownloadIt’s Daredevil’s sixth episode, Condemned, and it takes off where the last episode left off. In this episode: some news, some discussion, some feedback, and after the credits some Ant-Man feedback. http://media.blubrry.com/w2l7/p/media.blubrry.com/noodlemx/p/welcometolevelseven.com/wp-content/podcast/WTL7_104.mp3Podcast: Play in new window | DownloadAnother episode of Daredevil and another explosive ending brought on by Kingpin! It’s “AWKWARD DATE NIGHT” for six people from Hell’s Kitchen. Which couple will go home with the award for best date? Matt and Claire? Foggy and Karen? Fisk and Vanessa? Our journey into Hell’s Kitchen via Netflix’s Daredevil continues with episode two, Cut Man! 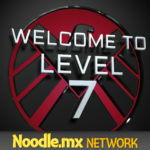 It’s the first episode of the Netflix Daredevil series, and the first episode of the Welcome to Level Seven summer!